The Ryder Cup is heading back to Europe as the host team secured victory Sunday when Phil Mickelson knocked his ball in the water at the par-3 16th hole, conceding his match to Francesco Molinari right on the tee box. 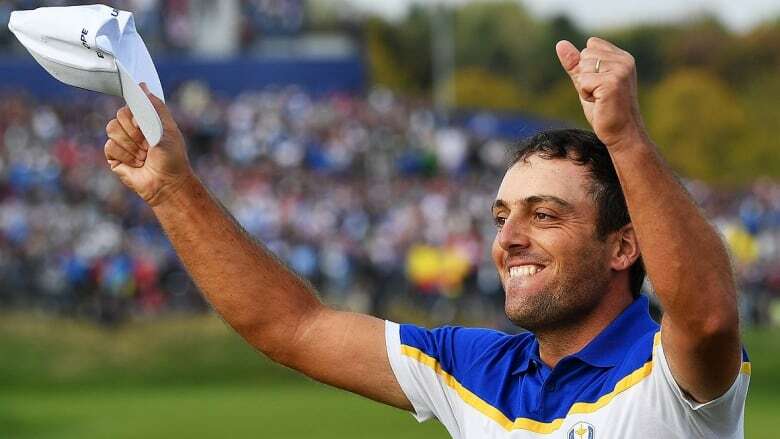 British Open champion Francesco Molinari was just as good on his own as he was with Tommy Fleetwood. The best year of the Italian's golfing life got even better at Le Golf National when he became the first European — and only second player since the current format began in 1979 — to win all five of his matches. This team has been incredible from the start. Nothing was going to stop us. — Europe's Francesco Molinari on his team's Ryder Cup victory over the U.S.
Webb Simpson and Tony Finau, the lone bright spot among the wild-card picks for U.S. captain Jim Furyk, won easily. Rahm won the first hole against Woods and never trailed. He dropped his putter after making a 5-foot birdie on the 17th hole as Woods stood to the side of the green, arms crossed. One week ago, he overcame four back surgeries to win for the 80th time on the Tour Championship, a signal that he was all the way back. He played so poorly this year that he failed to qualify for the PGA Tour's post-season. Thomas Bjorn picked him anyway, saying he was the like the captain of a football team. Garcia showed why by going 3-1. That final victory over Rickie Fowler made Garcia the biggest contributor in Ryder Cup history with 25 1/2 points. All that was left to determine was the final score with one match still on the course. By then, it was settled where dominance lies in these biennial matches. Europe now has won nine of the last 12 times.